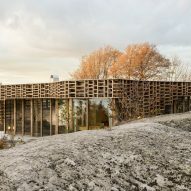 The cabin, named House on an Island, features large glazed walls wrapped by a gridded facade that is intended to create a "calm atmosphere" by filtering light like the leaves of a tree. "The inspiration came from the feeling you have when sitting under a tree. 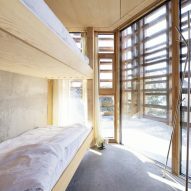 Getting the rays of sun filtering through the branches," founding partner at Atelier Oslo Nils Ole Brandtzæg told Dezeen. "Since the house is fully glazed the wooden structure also works as sun-shading and framing of the views. 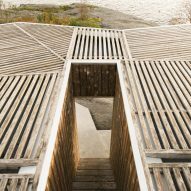 Towards the neighbours and south it is more closed while it opens up towards the sea and the horizon." 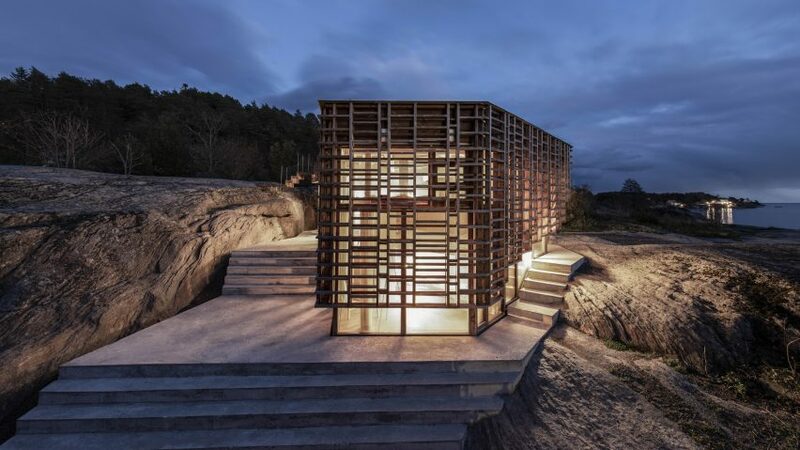 House on an Island's facade slots onto the cabin's timber frame. Both are made from heat-treated wood that will turn grey over time. 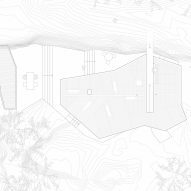 "The topography of the site was carefully measured to integrate the rocks into the project," explained the architecture studio. 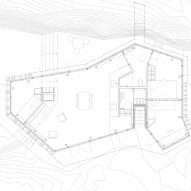 "The interior becomes part of the landscape and walking in and around the cabin gives a unique experience, where the different qualities from the site becomes part of the architecture." In the living room, Atelier Oslo has also used concrete to create a ruin-like structure that grows out from the building's concrete floor. It incorporates a bench, fireplace, and a day bed that is elevated on a micro-mezzanine level. 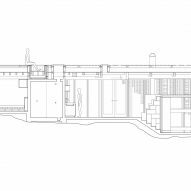 House on an Island is complete with a staircase that leads down to the entrance, puncturing the roof line of the cabin. 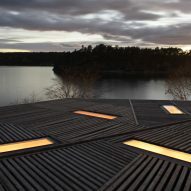 Here Atelier Oslo has incorporated a small bench, forming "the perfect spot to sit down and catch the last rays of the sunset."